Makes lovely flapjack and warming porridge! Organic Spelt Flakes, also known as rolled spelt flakes, are an ideal alternative to rolled oats when making a nutritious hot breakfast. Spelt is becoming increasingly popular as a substitute for wheat. 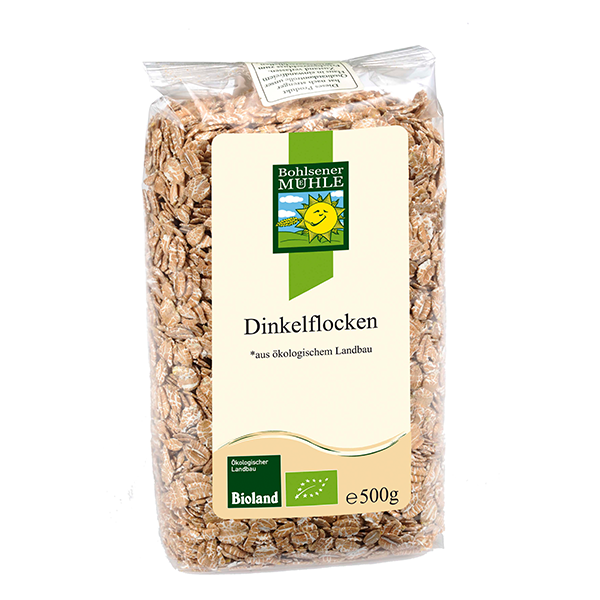 Organic Spelt Flakes have a slightly nutty flavour and can also be used in soups or vegetarian burgers. These flakes do not require soaking and can also be eaten without cooking. Just add 2 tablespoons organic spelt flakes into a bowl, add fresh or dried fruit, nuts and milk. However, if given to young toddlers we suggest to soak the flakes either over night in the fridge or an hour before breakfast if possible. Please allow to reach room temperature if stored in the fridge. Why not mixing with rolled oats for a delicious English breakfast porridge?